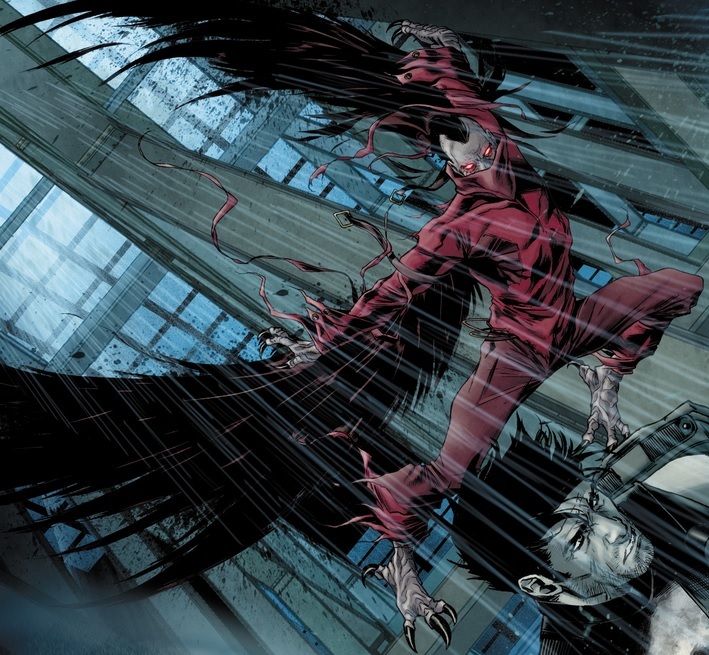 Powers/Abilities: The Vulture had superhuman strength (lifting one ton) and durability, and had large razor-sharp wings bonded to his torso, allowing him to fly. The Vulture could also vomit an extremely powerful acid, capable of dissolving flesh, bone, and Spider-Man's webbing. He later developed bird-like talons on his hands and feet. Due to his altered jaw structure, he could only speak with some difficulty. Prior to his mutation, he was highly skilled in the disposal of bodies. History: (Amazing Spider-Man II#623 (fb) ) - Jimmy Natale was a fixer for the New York Maggia. When Francis accidentally killed Joey's cousin, he called in Natale to dispose of the body. (Amazing Spider-Man II#624 (fb) ) - Irritated at having to constantly clean up the Maggia's messes, Natale contacted scientist Dr. Charles Goss, who had acquired mutagenic equipment previously used by Harlan and Farley Stillwell, about creating a new Vulture to eliminate weaker criminals. He presented his plan to Francis, Joey, and Dmitri, and brought them to Goss' lab, where he explained that their test subject would need to be quick, athletic, and ruthless...qualities that Jimmy happened to possess. Francis shot Jimmy in the leg and loaded him into the mutation chamber. Although Goss protested that he wasn't ready, the bosses insisted, and Natale was painfully transformed into the new Vulture. Although the operation and the trauma destroyed most of Natale's memories, he went rogue, and began picking off the mobsters. (Amazing Spider-Man II#592) - The Vulture swooped down on the docks after a Mob shootout, killing and devouring wounded criminal Joey. (Amazing Spider-Man II#594) - The Vulture pummelled the blinded Spider-Man until Spider-Man, using his spider-sense, blasted the Vulture in the face with webbing. Unable to tear it off, the Vulture retreated. The next night, the Vulture was lured to an alleyway by the cries of a webbed-up mugger, only to find Spider-Man lying in wait for him. Spider-Man tried to web him up, too, but the Vulture slashed through it with his razor-edged wings and flew off to Yankee Stadium, with Spider-Man in tow. He swung Spider-Man off him, sending him crashing through the owners' box, but Spider-Man recovered and grabbed him in a bear hug on the baseball field. He dodged the Vulture's acid vomit, but the Vulture taunted him, claiming that once Spider-Man tired he would feast off his bones. Spider-Man, suddenly enraged by the sight of Norman Osborn in the owners' box, broke both of the Vulture's arms and left him webbed-up on the field. (Sensational Spider-Man III#33.1) - Escaping from prison, the Vulture battled Spider-Man at the Hudson River Coffee House. The battle took them to the docks, where the Vulture used his acid vomit to burn a cable that had been lifting a shipping container from Redray Shipping. The container fell to the ground, revealing that it contained people who were being smuggled into the US. While Spider-Man and NYPD officer Carlie Cooper dealt with the people inside, the Vulture flew off. He watched over Cooper as she investigated the human smuggling case and the Vulture (mistakenly believing that he was in on it), and finally confronted her, snatching her off the street. (Sensational Spider-Man III#33.2) - The Vulture questioned Cooper, asking her why she was stalking him. When she mentioned human smuggling, he claimed not to prey on the innocent, and gave her a cellphone number (registered to "John Smith") before tossing her to Spider-Man. Later, he learned that Charles Devonshire, an FBI agent assigned to investigate the smuggling case, was on the payroll of the smuggler, Russian mobster Balik Vorski - and had pulled strings to get Vorski a big government contract. The Vulture grabbed Devonshire and took him to Vorski's base of operations, where he congratulated the mobster on his good fortune...and suggested they celebrate. (Amazing Spider-Man II#623 (fb)) - The Vulture was placed in a special containment unit in Ryker's Island prison. (Amazing Spider-Man II#623) - On Sasha Kraven's orders, Electro broke the Vulture out of prison. He flew off to his rooftop shack, where his memories of his past life began to return. He abducted Francis from his downtown office and flew him to his shack, where he devoured a rat and demanded that Francis tell him why he'd created him. Francis lied, claiming that J. Jonah Jameson had been responsible for his creation. The next day, the Vulture smashed into Jameson's City Hall office and confronted him, but Spider-Man was on the scene, and whipped the Vulture back out the window with a webline. The Vulture dissolved the webbing with his acid vomit, then flew back into the building, killing security guard Gabriel Graham. (Amazing Spider-Man II#624) - Spider-Man knocked the Vulture off Graham's corpse and tackled him out of the building, engaging him in a high-flying aerial battle that finally ended when Spider-Man trapped the Vulture in a giant web. As the Vulture slashed and burned his way free, Spider-Man webbed up the Vulture's hands...but even that didn't deter him, as he burned away the webbing, even though it meant also burning the flesh of his hands. The Vulture turned to go back to City Hall, but Spider-Man shouted that Adrian Toomes (the original Vulture) had told him that the Maggia had been responsible for his mutation, not Jameson. The Vulture took off to pursue his old friends - Spider-Man tagged him with a spider-tracer, but injured his arm and was unable to pursue the winged villain, and the Vulture later lost the tracer in his rooftop shack. The Vulture found Joey on his yacht in the Hudson; Joey initially denied everything, but when the Vulture threatened his wife, Joey told Natale everything. Despite this, however, the Vulture still moved in for the kill. Later, the Vulture soared above the ruins of the Daily Bugle. (Amazing Spider-Man II#644) - The Vulture, seeking Dr. Octopus' bounty for Lily Hollister's newborn child, attacked Spider-Man (who was protecting the infant) in Hamilton Heights, Manhattan. Before long, however, the Freak, who was also seeking the child, attacked the Vulture, allowing Spider-Man to escape. Vulture and Freak soon put aside their differences, and teamed up to get Spider-Man. They found him on a rooftop; while Spider-Man knocked Freak out of a fight with a water tower, the Vulture snatched the baby, only to find that it was a bundle of garbage. Stunned by the decoy, the Vulture was swiftly punched out by Spider-Man. (Punisher VIII#2) - The Vulture, having further mutated, was hired by the criminal organization the Exchange to ambush the Punisher at an abandoned building where they were planning to execute one of their hitmen. (Punisher VIII#3) - The Vulture grabbed the Punisher in his foot-talons and took off into the sky. He tried to drop the vigilante to his death, but the Punisher grabbed on to the Vulture's ankle and refused to let go - and then stabbed the Vulture in the leg. They engaged in a brutal battle in the air, as the Punisher stabbed the Vulture repeatedly in the torso, and the Vulture slashed Castle's face and burned him with acid. The Vulture nearly scratched Castle's eye out, but instead the Punisher managed to stab the Vulture first in the heart, then in the jaw, killing him. They both plummeted to Earth. (Punisher VIII#4) - The Vulture's body fell on a South Bronx rooftop, where it was examined by Carlie Cooper. Comments: Created by Mark Waid, Mike McKone, and Andy Lanning. 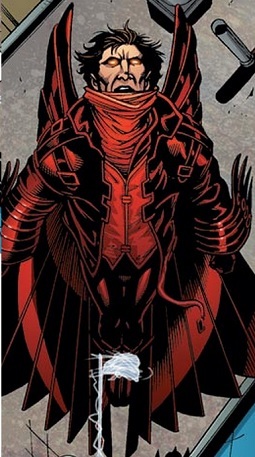 I always found the Vulture's original costume, while a good design, a little incongruous with his status as a feral mutated cannibal; his Marco Checchetto revamp works a lot better. Too bad he got murdered by the Punisher immediately after he got it. Vultures actually do have extremely acidic stomach acid, which they can vomit up as a defense mechanism. The Stillwells' equipment was also used to create the Scorpion, the Human Fly, and the Answer. Peter Parker eventually ended up faking a photograph to try to exonerate Jameson; Jameson instead caught wind of it and publicly exposed the fraud, ending Parker's photography career. Although released chronologically a year after the Vulture's death in the pages of Punisher, Sensational Spider-Man III#33.1-33.2 take place earlier, after the Vulture's first appearance. While it isn't depicted, the Vulture presumably went on to kill Francis, Joey, and Dr. Goss...and Charles Devonshire and Balik Vorski. Five bucks says Tom DeFalco watched the second season of The Wire (which also involved human smuggling and crooked federal agents) before writing Sensational Spider-Man III#33.1-33.2. It's left ambiguous as to whether Carlie steered the Vulture towards Devonshire and Vorski. 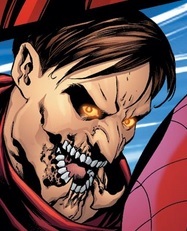 The Vulture has a profile in 2011's Spider-Man Saga. or the other Joey in this profile. Too many Joeys. (Amazing Spider-Man II#592) - Gang member Joey participated in a dockside shootout after robbing a warehouse belonging to a criminal named Giacomo. Joey was wounded during the battle, and his compatriots tied him to the pier and fled so he alone would draw the Vulture's attention. Joey tried to convince himself that the Vulture was an urban legend, but before long the creature swooped down on him and devoured him. (Amazing Spider-Man II#624 (fb) ) - Biochemist Dr. Charles Goss somehow acquired Harlan and Farley Stillwell's mutagenic equipment. Hired by Maggia fixer Jimmy Natale to mutate a test subject into a new Vulture, he demonstrated his equipment to Natale and his bosses...only for the bosses to volunteer Natale as the test subject. Although Goss wasn't sure if the equipment was ready, he used it to transform Natale into the monstrous new Vulture. (Amazing Spider-Man II#623) - Now working for Empire State University, Goss (presumably having been coerced by Joey and Dmitri) confessed to the police years later that he'd created the Vulture, but claimed that he'd done so under orders from J. Jonah Jameson. (Amazing Spider-Man II#623) - Francis, a New York Maggia member, killed his friend Joey's cousin, a member of the rival Karnelli family. He called in Jimmy Natale, a Maggia fixer, to dispose of the body. (Amazing Spider-Man II#624 (fb) ) - Natale presented Francis and his Maggia comrades Joey and Dmitri with a plan to create a new Vulture to eliminate the weaker members of the criminal fraternity. When he took them to see Dr. Charles Goss, the scientist he'd contracted to mutate a test subject into the Vulture, Francis shot Natale in the leg, then ordered Goss, at gunpoint, to mutate Natale while Joey and Dmitri loaded him into Goss' mutation chamber. (Amazing Spider-Man II#623) - When the Vulture escaped from jail, Francis called Joey and Dmitri to appraise them of the situation - only to be abducted from his downtown office by the Vulture. The Vulture flew him to his shack, where he demanded that Francis tell him why he'd mutated him. Francis lied, claiming that J. Jonah Jameson had been responsible for his creation. (Amazing Spider-Man II#624 (fb) ) - Maggia fixer Jimmy Natale presented his superiors, Joey, Dmitri, and Francis with a plan to create a new Vulture to eliminate the weaker members of the criminal fraternity. When he took them to see Dr. Charles Goss, the scientist he'd contracted to mutate a test subject into the Vulture, Francis shot Natale in the leg, then ordered Goss, at gunpoint, to mutate Natale while Joey and Dmitri loaded him into Goss' mutation chamber. (Amazing Spider-Man II#623) - When the Vulture escaped from jail, Francis called Joey and Dmitri to appraise them of the situation - only to be abducted from his downtown office by the Vulture. 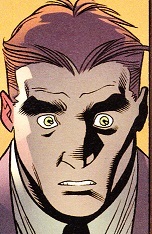 Joey and Dmitri moved into action to frame J. Jonah Jameson for the Vulture's creation. (Amazing Spider-Man II#623) - When the Vulture escaped from jail, Francis called Dmitri and Joey to appraise them of the situation - only to be abducted from his downtown office by the Vulture. Dmitri and Joey moved into action to frame J. Jonah Jameson for the Vulture's creation. (Amazing Spider-Man II#624 (fb) ) - City hall security guard Gabriel Graham saw Mayor J. Jonah Jameson running from the Vulture, clutching a fireplace poker. 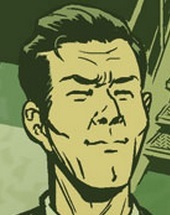 He took the poker and died protecting Jameson from the Vulture. (Amazing Spider-Man II#623) - Spider-Man found the Vulture huddled over Graham's body, mistaking it for Jameson's. (Amazing Spider-Man II#624) - Spider-Man knocked the Vulture away from Graham's body and told Jameson to get help, but it was too late for Graham. (Sensational Spider-Man III#33.1 (fb) ) - An FBI agent, Charles Devonshire and his partner Vito Casio were assigned to Homeland Security to investigate human trafficking. Devonshire soon found himself on the payroll of Balik Vorski, a mobster who paid him a monthly stipend to steer his investigation away from Vorski's businesses. (Sensational Spider-Man III#33.1) - Devonshire and Casio came to see the NYPD, learing that one of their officers, Carlie Cooper, had stumbled on to one of Vorski's human smuggling operations. They demanded she hand over all of her files on the case. Devonshire followed her, and photographed her snooping around the case. In addition to reporting her to her superiors, he also informed Vorski of her; he agreed to have her scared off the case. (Sensational Spider-Man III#33.2) - Devonshire visited Vorski again, and arranged to have one of Vorski's companies awared a five-million-dollar contract to secure the port of New York. As he left, he was swept up by the Vulture, and interrogated, leading him to Vorski. (Sensational Spider-Man III#33.1 (fb) ) - A Russian mobster who operated out of the Little Nikki restaurant in Brighton Beach, Balik Vorski had his hands in a number of criminal enterprises, including human trafficking, which he did via his Redray Shipping subsidiary. He had an FBI agent, Charles Devonshire, on his payroll to keep the government out of his way. (Sensational Spider-Man III#33.1) - After a fight between Spider-Man and the Vulture uncovered his latest shipment, Vorski met with Devonshire, who agreed to take care of Carlie Cooper, an NYPD officer who was investigating the case.